I'm a HUGE personality buff. I've always been that way. I think I was 15 or maybe 16 the first time I learned that we all have different personalities. It helped me understand why my brother and I could be SO incredibly different and still have a few common traits. It later served me well when understanding why certain careers or hobbies appealed to my personality. And now, as a wife & mother, it has helped me learn why certain things are tougher (or easier) for me to deal with. 1) It helps you understand what makes you tick! This may seem so trivial, but knowing what little things make me tick seems to aid in an overall sense of happiness. For example, I LOVE making lists. By starting my day (or even ending my day) with lists helps me feel more accomplished. It also helps me to stay focused & motivated. Which is a huge blessing, because I am easily distracted. It's the little things that add up! 2) It helps you understand what makes you uncomfortable. Even though I'm an extrovert, I'm actually what they call a "hybrid extrovert". Meaning, I enjoy being around people, but at the same time it can make me very uncomfortable. I'm the kind of person who can rarely say no to a party, but it also gives me anxiety. Why? Because I'm very in tune with people's emotions. If I go to a big get together, I can usually sense right away if something is wrong or if someone is upset. Which in turn, makes me upset. It's just how I respond as an ENFP. 3) It helps you understand your homemaking style/career/hobbies/etc. I've often wondered why a typical 9 to 5 job with the same 'ol routine doesn't appeal to me. Now, give me a job that allows me to be in tune with my creative side and has great flexibility, and your singing my tune. If all people understood this, I think the work force would be a much happier place. The Myers Briggs personality test is fantastic. You can learn more about MB at their web site here. Here is a great breakdown of what all those letters & terms mean. 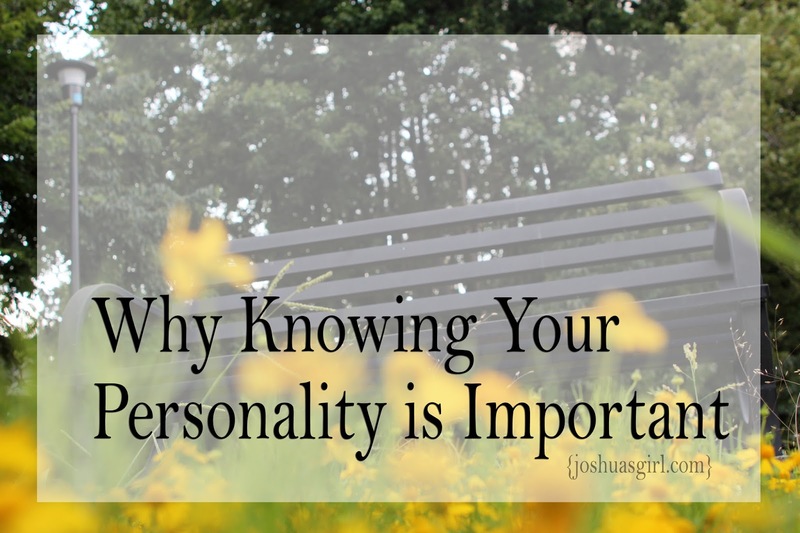 Do you know what your personality is? I'd love to hear about it! Linking up at Homemaking Mondays & One Project. This is awesome! Thanks for recommending that book. I've read a couple of his other titles so I'm going to check that one out. My husband and I had a good laugh one evening upon taking the test and realizing we had polar opposite personalities! But upon reading more into our personality traits, especially in the role of parenting, we realized that we complement each other perfectly. Isn't God amazing!!? I have been on a "personality kick" this week, so it is funny to find this post today! I recently had to resolve a conflict with a dear friend of mine and as an INFP, there is almost nothing worse to do! (haha) But it is so true to know ourselves. It helps! I read the "Personality Plus" book and it really helped me as well! Especially with my relationship with my husband! :) Thank you for sharing this on the Art of Home-Making Mondays! We are glad to have you!